What started as a random idea amongst a group of student-athletes two years ago, turned into a club, and now is recognized nationally for innovation in sustainability. Meet the Beaver Athlete Sustainability Team (BAST), a roster of committed young men and women with the goal to make Oregon State Athletics cleaner, more efficient, less wasteful and sustainable. The BAST student-athlete leaders represent a cross section of sports: Jesikah Cavanaugh (swimming), Samantha Lewis (track and field), Marie Gülich (basketball), and Mimi Grosselius (rowing). 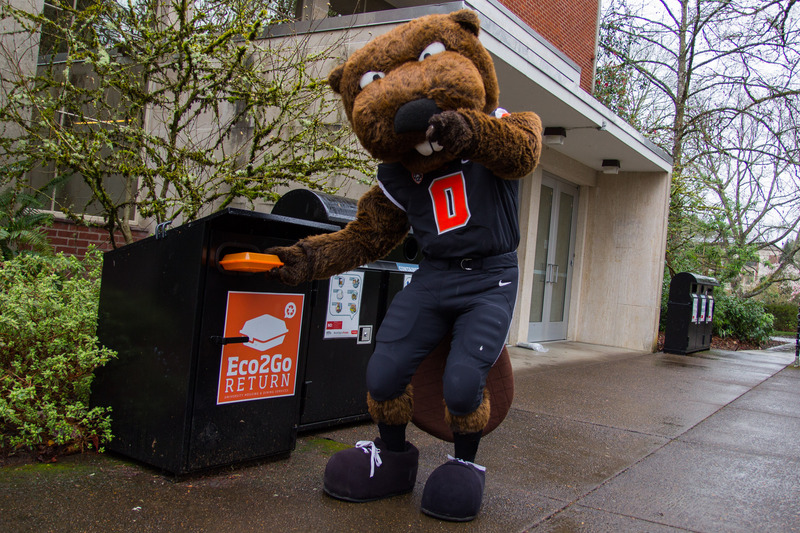 BAST, in conjunction with Campus Recycling, spearheaded increased awareness of recycling best practices at all of OSU’s athletic facilities on event and non-event days. 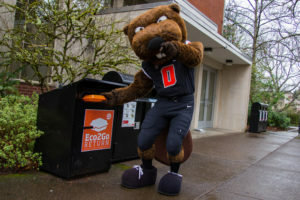 Examples include a composting initiative at the Beavers’ Sports Performance Table, increased light sensors throughout facilities, and the promotion of the use of reusable containers. BAST is also in the midst of a feasibility study for the installation of solar panels at arenas and stadiums. WHO CAN PARTICIPATE? : All student-athletes who are interested in making the world a more sustainable place are encouraged to be a part of this team, with no prior experience needed. Student interests range from recycling, compost and food disposal, energy efficiency, waste removal, material science analysis, community project engagement, solar and hydroelectric power solutions and other energy efficient activities. STRUCTURE AND PROCESS: The BAST team meets every two weeks and encourages all current members and new members to attend. The meetings consist of determining what projects are pending and which new projects the team will take on. There are also tactical discussions around marketing how projects positively impact athletics and the community. The BAST team will also always participate in Earth Day in April on campus. COMMUNITY SERVICE ASPECTS: Beginning in 2017-18, there will be one community engagement project each quarter. The BAST team will collaborate with the local community to accomplish a sustainability project. FUNDING IMPLICATIONS AND OPPORTUNITIES: Athletics provided a small budget this academic year to create events in Portland, Ore., and beyond with current and former student-athletes. The goal for additional funding for the upcoming academic year would provide two student-athletes the opportunity to attend sustainability conferences at the Green Sports Alliance and Pac-12 Conference, and develop additional community service initiatives.